On a rainy, spring day in 2002, I walked into the offices of Street Roots in Portland, Oregon. I was clutching a small stack of B&W prints that I had printed and matted myself. The photos were of the subject matters that any earnest, just-starting-out photojournalist would deem "important" - protests, people experiencing homelessness and moody still-lifes of wet city streets. I was new to Portland, and new to photography in general, having just recently graduated college where I had taken two photo courses. These classes and the hours spent in the darkroom were a respite from pursuing a grueling computer science degree that made me sure I wanted to spend as little time in front of a computer as possible after I graduated. Sitting at the table were Bryan Pollard and Israel Bayer who had begun the newspaper together a few years prior. They said some cursory nice words about the work and asked if I could go take some photographs out at Dignity Village, a homeless encampment that had organically sprung up in a parking lot on the outskirts of the city recently. Armed with the self-assurance that comes from having an actual assignment from an actual newspaper, I drove out to the camp the next morning. At this point I had never had an education of any sort in journalism. I had never worked for a newspaper, or frankly had any kind of photographic assignment. The experience of taking photographs had been strictly a personal one and I was unsure what it meant to be making a photograph for someone other than myself. A hard rain overnight had left the camp pockmarked with deep puddles and I stepped carefully around piles of discarded blankets and tents set up on wooden pallets. It was quiet and the only living thing I saw was a family of feral cats that walked silently among the blue tarps and debris of people who simply didn't have another place to put their belongings. After a few minutes, I heard a muffled conversation behind a half-open tent, and walked towards it, taking deliberately heavy steps to ensure I wouldn't be surprising anyone. I don't remember much about the couple I talked to in that first tent, but they were surprisingly friendly to this young photographer who, on so many levels, had no reason for being there. I asked if I might make a photo of them lying there in their tent with most of their possessions neatly arranged around them and they very kindly agreed. I took maybe two frames before thanking them and continuing on my way. I spent the rest of the day there, trying to keep my feet dry, making friends with the cats and being amazed and thankful at the generosity of people I met. Most of them seemed to intrinsically understood the importance of having this camp seen by the general public, despite this responsibility being given to someone wholly unqualified to do so. The next week, a photo from that day ran, three inches by two inches, showing a rain-soaked tent and its reflection in a puddle. This was the first photo of mine to be printed anywhere and I couldn't have been more excited. So began a four year photographic relationship with the paper, which focused on housing/homeless issues. For a long time, the work felt difficult. Growing up in the New Jersey suburbs had given me little exposure to people from different social and economic classes, and I was forced to reset my expectations and face up to my own preconceptions and prejudices. I learned to listen carefully to people and to make photography an organic part of my interactions. In retrospect, it felt like a pretty ideal photographic education, minus the photography part. We left Portland eight years ago to move to DC and I've continued to support the paper in any way I can. 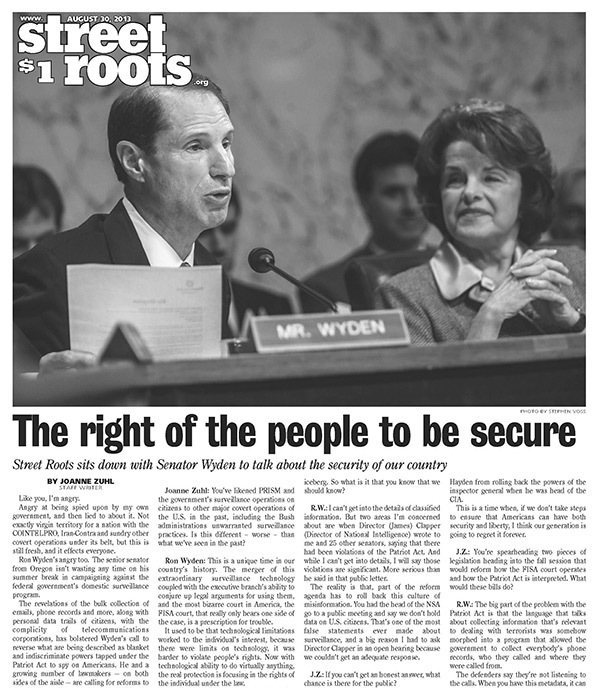 So, when I received an email from Israel last week asking if I had any photographs of Senator Ron Wyden, I quickly searched my archives. I came across a few images of him during the confirmation hearings for CIA Director Michael Hayden and passed them along. Last Thursday, I received their weekly email newsletter and saw my image on the front page of the new issue. This tearsheet isn't so much about the photo, but rather feels like a good opportunity to revisit the seeds of this photographic journey over the past eleven years and maybe to start creating some new maps for the future. And without that first assignment, given to me as I nervously held my stack of B&W prints, it's hard to know where it would have gone. For that, I'm forever grateful.